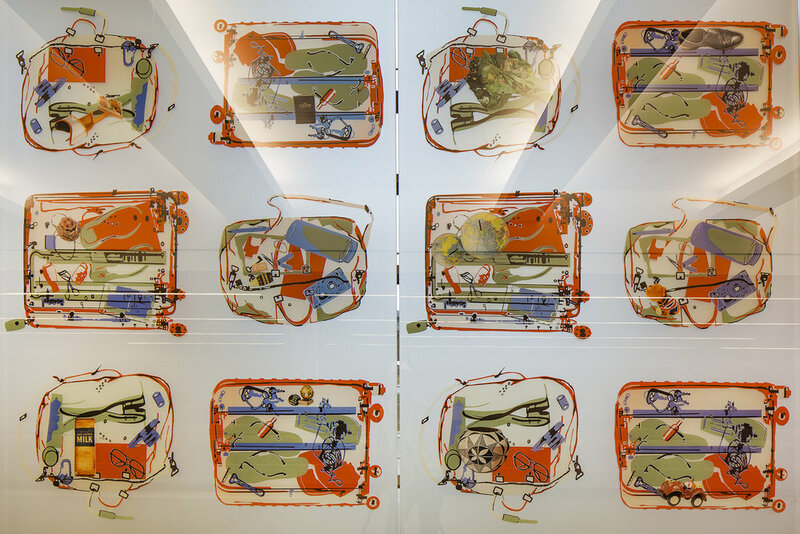 "Carry On", a 12 foot tall and 300 foot long glass art wall in the San Diego airport, displays hundreds of photographs of personal objects superimposed over abstracted x-rays of carry-on bags. The x-rays are abstracted through a screen printing process, and then printed directly upon the glass. To-scale etchings of photographed objects are imposed upon a second sheet of glass. These objects are collected from dozens of local artists, airport employees, long-time San Diego residents, museums and cultural institutions. The wall is a portrait of San Diego through the objects we carry, suggesting the myriad stories told by the contents of one's luggage. The wall greets international travelers as they collect their bags before passing through customs. Outside, their friends or loved ones might wait, and view the wall from the street.